While on holiday during December at the Marlborough Sounds we did a few sets with the longline rig off Cloudy Bay in Rarangi. The first set went out very slowly, stalling when the hook section was only metres away from the shore. While other local kontiki fishers looked on, we were told we would catch nothing. Apparently this area is infested with paddle crabs. So, we retrieved the gear and sure enough, a large paddle crab was attached to every hook. I quickly ran along the line grabbing as many of the little suckers I could, chopped them in half, and firmly attached them onto the hooks for the next set. By this stage the winds had increased and the second set went out beautifully. The line was out dead straight and we left it to fish for only half an hour before retrieving it again. The locals all gathered round as the line came back to shore with six huge kahawai and three hapuka! It was amazing!!! After seeing what we had brought in, several kontiki fishers also set their gear out with similar results. One in particular caught an incredible five grouper on just the one set. They were all caught on the furtherest out hooks. ED : Thanks Nic, these are the only beach caught grouper pictures we have seen. When we cleaned the hapuku we found that they were full of paddle crabs around the size of a fifty cent coin. We learned that the local fishers in this area hold an annual kontiki fishing competition, but unfortunately, it happened to fall on the day after we had to return home. Last weekend we headed up to Te Arai point and ran two sets with the longline. We caught two snapper on the first set and one on the second set. Although there were only three snapper caught, they were all a really good size and it was a great day out. At long last the fish are running from the beach. It has been very lean from the shore since Christmas. On Saturday we set our super kite longline with 23 hooks and a wind directly off Waihi Beach to 1000 metres. The kite was rather slow getting out and we returned with 4 snapper on the first set. During this time there was a wind shift to northwest. Our next set we added the skyhook to the line and a tacking rope to the kite. The kite went directly at right angles to the beach. We returned 8 snapper and a monk fish. We did not have to return any under sized snapper. Hopefully this will be one of many more reports from us now that the fish have returned. Incidentally, we used a combination of mullet, squid and salted bonito on alternate hooks. On February 5th there was no wind for my kites so I used the torpedo instead. Low tide was at 8:30pm and I headed onto the beach just before 8:00. I ran two sets for a total of eight snapper, five gurnard and one kahawai. One snapper was 4lb and the others were just an average size. I used 5/0 Target hooks and some floating bead traces that worked very well. I also managed to lose three hooks, must have been some big fish! 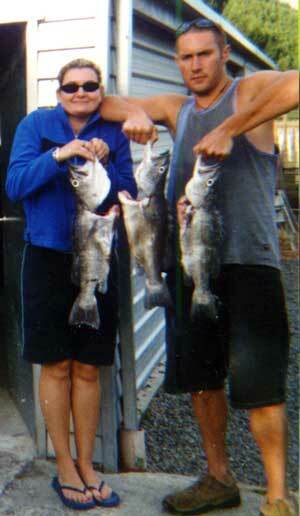 According to Gary there has been some awesome fishing at Muriwai Beach recently. 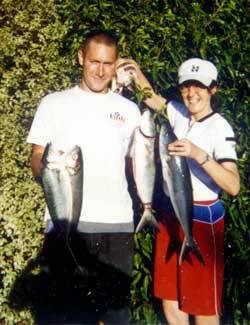 Fishing just north of the Rimmer road beach access, Nick Milliner from Helensville set out his longline rig. There was not enough wind for his delta kites so he ran the gear out with his jetski, twice. Nick caught four large snapper on his first set and 15 snapper on his second set. Gary was up at Muriwai just last weekend fishing a 65kg dropper rig setting only 5 hooks per set. Using salted mullet bait on 4/0 Target hooks Gary wound up with four snapper and one gurnard from just one set. An outstanding 100% catch rate Gary. Thanks for the report. Robbie phoned in last week to report that the fishing at Uretiti has been very hit or miss lately. Apparently on a recent kitefishing trip Robbie did one set with his longline rig and wound up with just one snapper and one spotted dogfish. 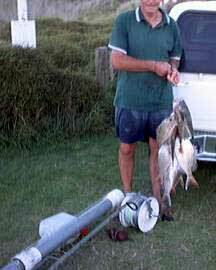 Another kitefisher, just 600 metres or so further down the beach, wound up with eight nice snapper ranging in size up to around 5lbs. Fishing late afternoon and early evening seems to be the best here at the moment and good, firm fresh bait is always best. Don't forget to take your camera when you go fishing and send or Contact Us in your pics please.